Startseite » Qualitätszeichen BW » What is the quality label? 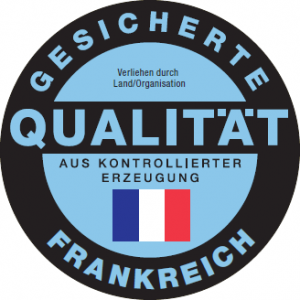 The quality label of the state Baden-Wuerttemberg is a quality label for products grown and processed according to special product-specific conditions. These conditions go beyond the statutory requirements. The quality label makes it easier for consumers to recognise high quality products. Products that meet the requirements for the label “Non-GMO” according to the EC Genetic Engineering Implementation Act (EGGenTDurchfG) (with the exception of milk and dairy products, beef and pork: here, a transitional period stands until December 31, 2017). 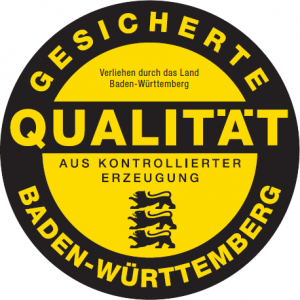 The quality label with indication of origin of Baden-Wuerttemberg is a hallmark for products grown and processed in Baden-Wuerttemberg according to basic and supplementary requirements. The participation in this quality scheme is generally open to all businesses of the agricultural and agro-industrial sector of the European Union. Thus, the following alternatives could be feasible for the quality label with indication of origin outside of Baden-Wuerttemberg. The hallmark defines products grown and processed according to both the legal requirements of the EU Eco Regulation as well as to product-specific basic and supplementary requirements of a defined region of origin outside of Baden-Wuerttemberg (such as Rhineland Palatinate, Saarland, France). The use of the quality label may be authorised without indication of origin: The quality label without indication of origin is a quality label for products grown and processed according to product-specific basic and supplementary requirements, but that will not be categorized to a certain origin. The provisions of the quality label define binding criteria in product-specific basic and supplementary requirements for numerous agricultural products and processed products. These must be respected when growing or producing as well as processing (process and product quality). These requirements go beyond the statutory requirements. Satisfaction of the requirements of the labelling “non-GMO”. Special requirements for marketing standards in the fruit and vegetable sector (e.g. only EU marketing standard Extra I or respective UNECE standards). Increased quality requirements for beef and veal, pork, lamb and poultry meat. Mandatory participation in quality assurance systems and residue monitoring. Ban on feeding fish meal to ruminants. Ban on sewage sludge as fertilizer. Preferred use of gentle means; preferably mechanical weed control. Using mainly feed that stems from own production. Conclusion of a care contract with a farm veterinarian. Max. animal transport time of four hours to the slaughterhouse. Monoproducts designated to a region of origin, such as potatoes or meat, must be produced according to the requirements of the quality label from that designated region. Animals must be raised and slaughtered in the designated region; specific regulations shall apply to brought-in animals, such as piglets. Upon request, the MLR awards the right to use the organic label by means of a license agreement to organisations, associations or alliances of the agriculture and agri-food industry, which are able to provide monitoring of the label’s use regarding the applicable provisions. Currently, the following licensees are listed. Users of the trademark are businesses of the agricultural and agri-food sector that utilise the quality label towards the consumer. For this purpose and depending on the product, they conclude a trade mark agreement with a licensee and will hence be integrated into the quality assurance and control system. They agree to comply with the label’s general and product specific rules and requirements during processing and marketing at all times. At present, approximately 500 users of the quality label Baden-Wuerttemberg are listed for their products (as of January 2016). Businesses interested in the use of the quality label shall inquire in writing to one of the licensees. Producers are businesses producing agricultural goods for the use of the quality label. They agree to comply with the quality label’s rules for the agricultural production at all times. Currently, approximately 6,500 agricultural farms are integrated into the quality label Baden-Wuerttemberg as producers (as of January 2016). 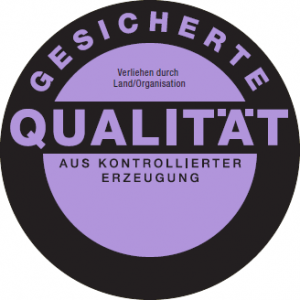 As a producer, how can you participate in the quality label of the state Baden-Wuerttemberg? For this purpose, producers conclude a participation agreement with a licensee and will hence be integrated into the quality assurance and control system. The employees of MBW Marketinggesellschaft will be happy to provide you with more information. All participating producers and all trademark users are obliged to perform inspections of their business with the aid of detailed checklists on a regular basis to ensure that all requirements of the quality label are fulfilled when growing or producing. Neutral inspections will be performed in fixed intervals as sample checks by trained auditors of accredited neutral monitoring institutions whose professional expertise has been proven in an accreditation process. Basically, the neutral inspections will be performed in the same manner by all monitoring institutions on the basis of a predefined schematic plan. All raw products are subject to drawing random samples which are then examined for residue of undesirable substances in accredited laboratories. Processed products (meat products, juice, beer, etc.) must prove their quality in regular intervals; e.g. in quality inspections according to the DLG test scheme or similar. Both the neutral monitoring institutions and licensees of the quality label must account for their control and monitoring activities at trademark users and producers on a regular basis. In an annual audit, the owner of the label or a representative will verify whether all necessary inspections have been performed completely and in a proper way.